Congratulations - You Made a Great Choice! Congratulations on purchasing a handcrafted product from Timeless Wrought Iron. You made a great choice and now all you need is a little bit of patience. That�s because handcrafted wrought iron furniture is not like the cheap stuff you find in big-box stores; rather it�s hand-crafted by master blacksmiths using centuries-old techniques. They aren�t doing it for show. They�re doing it to give you the highest quality furniture and accessories you can find in today�s market. Ordering from Timeless Wrought Iron means you�re presented with the best of the best � we hand-select every piece displayed on our site and only work with the most skilled and trustworthy blacksmith shops. We may not craft the furniture ourselves, but we work closely with our partners to make sure you get the perfect product at a great price in a timely manner. Now all you have to do is sit back, relax, and await your delivery of timeless wrought iron. Why do you have to wait for your order to be delivered? Because perfection takes time and each piece of wrought iron is individually cut, bent, hammered and shaped to fit your exact specifications. You can compare it to the food industry. When it comes to dining out, you often have two main choices: fast food or gourmet restaurant. Fast food is quick and easy to get, but offers bad quality ingredients, poor service and an experience that is easily forgettable. The cookie-cutter furniture you buy off the shelf at a store is just like fast food. It�s easy to get and even easier to forget. It doesn�t always offer the best quality or style and it doesn�t astonish you or your guests. On the other hand, dining at a gourmet restaurant is a slower affair, but the food and service is of the highest quality and the experience is extremely memorable. Custom-built wrought iron furniture is like your gourmet restaurant - impressive in appearance, sturdy in construction, and stylish in design. You�ll love the way it looks in your home and you can imagine the compliments you'll receive from family and friends. Getting the perfect custom-built wrought iron furniture may require a little patience, but it�s well worth the wait. Now that you�ve placed your order on Timeless Wrought Iron�s website, the journey of your product�s creation has begun. It�s a relatively straightforward process, and yet no step is taken lightly. Processing: First, your order is sent from us directly to the appropriate blacksmith shop. 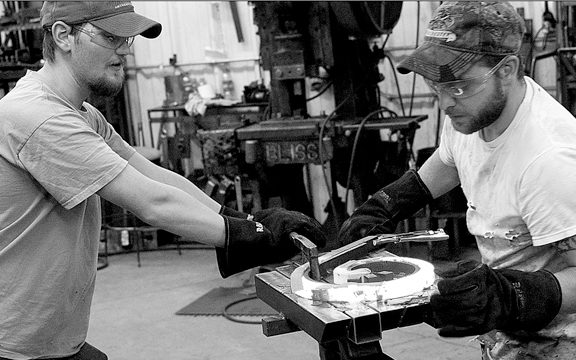 We have incredible working relationships with our blacksmith partners, so your order is always a priority. Development: Next, it�s the blacksmith�s turn to determine what needs to be done. While each blacksmith shop features its own style, techniques, facility setup, and team, they all have one thing in common � a master blacksmith. Master blacksmiths are the most experienced kind of worker and the person in charge of designing, creating, and overseeing your wrought iron order. See sidebar: Master Blacksmith Training. Construction: The creation of your wrought iron furniture is labor intensive. While the material is quite malleable, each piece involves hours of smelting, forging, bending, hammering, slagging, welding, and designing. Quality takes time and blacksmiths never rush the process because they know full well that they�re creating something you can enjoy forever. Delivery: Once the wrought iron order is complete, the blacksmith shop carefully ships it to your address. As wrought iron furniture is typically heavy and bulky, it often takes time for delivery to be completed. Most of the time orders can be shipped via standard ground but larger order will have to be shipped via Semi Truck. Expect 7 - 15 days for delivery depending on how your order ships. When your order ships you will receive an email with tracking information so you can track the progress of your shipment. Becoming a Master Blacksmith is not an easy feat � it takes 2-3 years and heaps of knowledge gained on-site to attain such a status. To earn the title of fully developed Master Blacksmith, a person must first be fully invested in the labor-intensive training. There are some apprenticeships and trade schools available, but there is no formal education. Training begins directly at a blacksmith shop. It is an art that takes time to develop and involves an appreciation and respect for the deep history, traditional techniques, and fundamental responsibilities of the trade. It also requires a significant amount of concentration, practice, trial and error, and patience � concepts that may seem easy from the outside, but whose execution is toilsome. Only after multiple years of training does a blacksmiths get an opportunity to prove his worth, often submitting his best work to boards and other master craftsmen for approval. If his skills and techniques have ascended to the top, the title of Master Blacksmith is attained. Unique Style - Wrought iron is a highly malleable material so it can be shaped and formed into endless patterns and designs. You can opt for classic or contemporary, Old World romantic or nature-based scenes, just to name a few. The ability to have uniquely-styled wrought iron furniture and accessories means your home is blessed with a personality like no other. Durability - Wrought iron is built to last. It can withstand years of use, it can hold lots of weight, and it doesn�t scratch or mark up easily. Boasting such durable material, wrought iron furniture is designed to be passed down to the next generation. Practicality - Wrought iron is still used today because it remains as comfortable as any other furniture type. It�s solid mass means it won�t knock over easily, but it�s thin framework means it�s light enough to move about. It�s also easy to clean with a dust rag or wet cloth. Versatility - Wrought iron is an extremely versatile material. With various shapes, sizes, and finishes, wrought iron can be used to match any decor, fit any space, be used indoor or outdoor, and satisfy any personality. What more could you want? Thank you for taking the time to learn about the journey of your custom-built wrought iron order. We hope you�re as excited about your purchase as we are at Timeless Wrought Iron. We�ve experienced the wonders of wrought iron in our home for many years and know how much excitement it will add to yours. You should expect your order to arrive in the allotted time. If you have any questions or concerns, please contact us at (800) 957-1178 or cs@timelesswroughtiron.com. Thank you for your using Timeless Wrought Iron. Come see us again and add another touch of timeless tradition to your home.